Congratulations to "Betsy P.", the winner in Misty's giveaway. Thank you to all who participated! I like writing heroines who travel a lot and pick up skills from every place and culture they visit. Many of my heroines get to have nifty hobbies based on whatever has grabbed my interest at the moment, especially if I’ve tried out a new hobby myself. For example, both my hero and heroine in Fatal Truth, the first book in the Shadow Force International series, are into yoga because I’m a yoga nut and recently went through teacher training. Author by day, yoga teacher by night—that’s me. The whole basis of the story bloomed from my own experience learning to belly dance. I learned to shimmy and throw my hips out of place by a fellow yogi trainee who’s an awesome a belly dancer. I might not have the moves like she does, but I love the music, the tempo, and—let’s be honest—the costumes rock. I decided during my first lesson that Ruby had to be a belly dancer, which led to Morocco, which led to a night of passion with the hero. Sometimes, that’s how books plot themselves for me. As a fan of in-depth research, I believe my own experiences add depth to my characters. Plus, this type of hands-on “fieldwork” is just plain fun, and although, I don’t get to blow up cars or go on night raids like many of my military heroes, darn it, I can (and do) enjoy less violent research. LOL. Okay, readers, what do you think? Does an author’s own experiences give a story a behind-the-scenes edge? Do you like learning about different hobbies, careers, and cultures through romance stories? Leave a comment below to be entered in a drawing for a copy of Fatal Truth, the book that started it all in the Shadow Force International series. 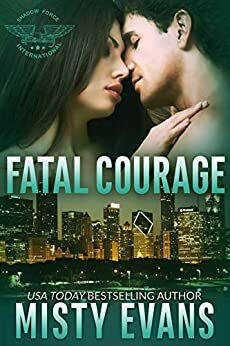 And check out my belly dancing heroine, Ruby, in Fatal Courage, out this week! Giveaway ends 11:59pm EST August 28th. Please supply your email in the post. You may use spaces or full text for security. (ex. jsmith at gmail dot com) If you do not wish to supply your email, or have trouble posting, please email maureen@justromanticsuspense.com with a subject title of JRS GIVEAWAY to be entered in the current giveaway. I love reading about characters who go to interesting places or do interesting things. Learning about new hobbies or activities in books is great. And if the author has actually experienced it themselves I think it lends more realism to the character. Especially if the character is just learning something, the author can draw from their experience and remember what it was like the first time they walked into a classroom or studio. And learning belly dancing sounds like fun! hi Laura! Belly dancing is fun. I highly recommend it! oooh... belly dancing does sound like fun! and empowering :) thanks for sharing! I do think person experience would help in writing. I also like reading about things that I will never personally do or travel places I will never go. Me, too! I love learning new things, and often times the only way I'll learn them or experience them (such as a new place) is by reading about them. I love when an author brings in their own experiences to a character or story. It makes the story that much better. I remember Kaylea Cross once had a character in her story that did belly dancing and Kaylea herself was a belly dancer. Fun! There's a certain mystery about belly dancers that's fun to explore in stories as well as real life! I think that when an author brings their knowledge and experiences to a story it shines through. Makes the reading experience all the better for it. Yes, I do think an authors experiences give the story a behing-the scenes edge. And, I think variety in ones life keeps it fresh and interesting. Absolutely, Betsy! I've tried a variety of dance (ballet, tap, salsa, and now belly dancing) and I enjoy them all.